Martha Stewart Stationery for Crane & Co. has intricate Save the Date Cards, Wedding Invitations and Wedding Menus. The designs include Crown Motif & Monogram Design Wedding Invitations, Wedding Menus and Save the Date Cards as well as Scroll Wreath, Feather Wreath, Calligraphy Love and Calligraphy Bird designs. 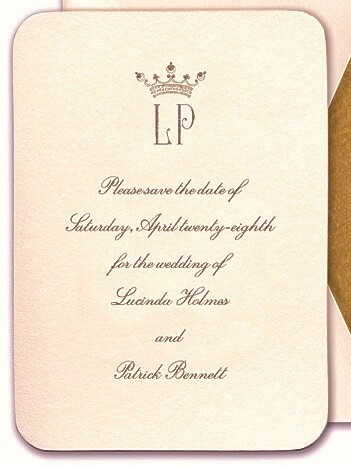 The above example of Save-the-Date Card from Martha Stewart for Crane illustrates Crown Design with gold ink on ecru stock and rounded edges. These stylish Save-the-Date Cards by Martha Stewart for Crane & CO. are a fun and simple way to announce the upcoming nuptials. Matching or complementary Wedding Invitations, Wedding Response Cards, Wedding Menus, wedding place cards and accommodation cards complete the Wedding Stationery Set. Martha Stewart Stationery offers this designer stationery using high end papers and printing from Crane and CO. To see more Martha Stewart Save the Dates and stationery ideas come in to our San Francisco, CA store or go to our Shop Online page. For more wedding invitation designs go to www.hyegraph.com.